Josselyn Parma Almonacid was born in Frutillar and is of Italian German descent. Her grandmother was one of the German settlers who came to this area. Josselyn was born into a family where all cooking was done with German home cooking recipes and home grown ingredients, with a specialty in the sweet treats that the family shared at togethers. In 2011, we started this family venture after returning from a 7 year stay in Spain. 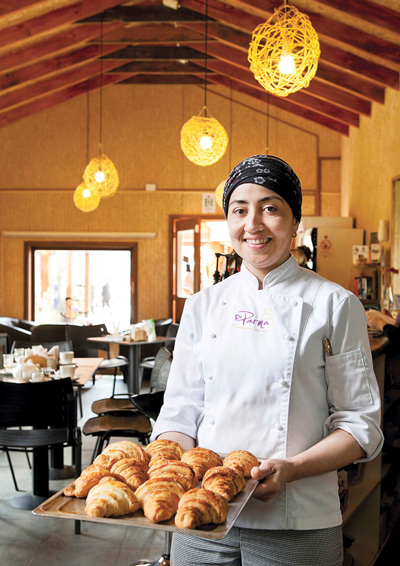 Josselyn wanted to create a bakery cafe in the center of Frutillar that offered variety and also included some of the ingredients and recipes she had acquired while abroad. As a team, the family saw the necessity for a good gathering place for family, friends and business meetings. DiParma Bakery Cafe would be the perfect place for that. Josselyn works with her mother, brother and her daughter. DiParma today offers a homemade fusion of local and imported products. We pride ourselves in offering the best customer service with close attention to detail ensuring that our customers have the best possible experience while at our bakery cafe.